A bund is a liquid containment facility that contains leaks and spillage from tanks and pipes. Frequently, the liquids in tanks and pipes are toxic, but bund lining is used to prevent the liquid from causing damage (either by force or its chemistry). If a large tank has a catastrophic failure, the liquid alone can cause extensive damage. In many schools and factories there are bunds that range from holding chemicals to drinking water. Particular examples which receive specific attention in the UK, the rest of Europe and the USA are oil and fuel storage tanks and transformers at electricity sub-stations which are filled with oil for cooling and insulation purposes. Properly built bunds have to be large enough and strong enough to contain the contents of an entire tank, though regulations require it to contain 110% of the content of the tank or container. When multiple tanks share a bund, the capacity is based on the largest tank. One of the most common bund designs for large tanks is a concrete or masonry wall built off of a concrete slab. Concrete and masonry works very well for many liquids, but Polyprufe bund liners should be used to decrease permeability. Bunds can lose their ability to contain fluids due to poor detailing of joins, cracking, chemical erosion, accidental damage. Maclennan’s bund lining system is elastic, seamless, fully bonded, impact and abrasion resistant and will not degrade due to UV light. The bund lining is spray applied onto concrete, timber or metal and so can be detailed around pipes fittings and fixed plant. The bund lining is hard and ready to walk on in seconds. Unlike most bund linings, this can be applied to damp concrete. The system is superior in every way to the GRP systems, epoxies and cementitious coatings. 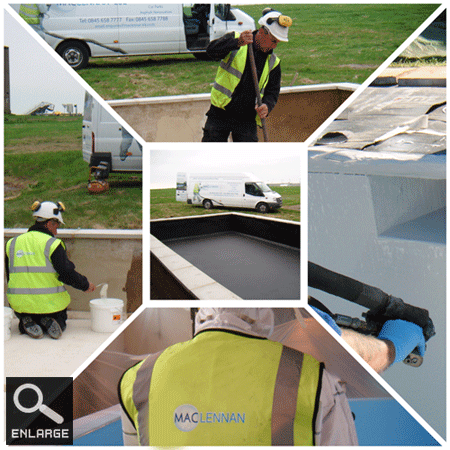 MacLennan have a range of systems for repairing the structure of the bund prior to installing a lining which is resistant to most fluids including fuels, acids, solvents. MacLennan’s system is durable, very elastic, will accommodate movement in the substrate and it does not become brittle in sunlight. Our extensive range of waterproof coatings can line your tank and protect them. Over time, a steel tank can suffer from corrosion, chemical erosion and weather deterioration, causing failures or weak spots on the fabric of the tank both internally and externally. To maximise the life of your tank, and to save thousands of pounds in replacement costs, MacLennan has the developed a tank lining products that safeguards your tank for many more years whilst enhancing the structural characteristics. Our Seamless spray applied Polyurea tank coating comes in a variety of colours, cures in seconds and is guaranteed for 20 years. Unlike the commonly used polyurethane paints, our product has quick curing time, can be applied on a damp substrate, is solvent free so ventilation is not a problem and is a single coat tank lining system, rather than the 2 or 3 coats that are generally required for polyurethane paint based tank lining. Our products are environmentally safe, with no solvents, no emissions and no VOC.